London, UK (December 3, 2018) – The film version of the multiple Tony award-winning Lincoln Center Theater production of Rodgers and Hammerstein’s THE KING AND I: FROM THE LONDON PALLADIUMhas become the biggest theatre event in cinemas of 2018 following yesterday’s (29 November) screenings around the world. The production is expected to take $2.5m at the box office. In the UK the film reached the number one spot, with more than double the box office of the next film, Fantastic Beasts: The Crimes of Grindelwald. 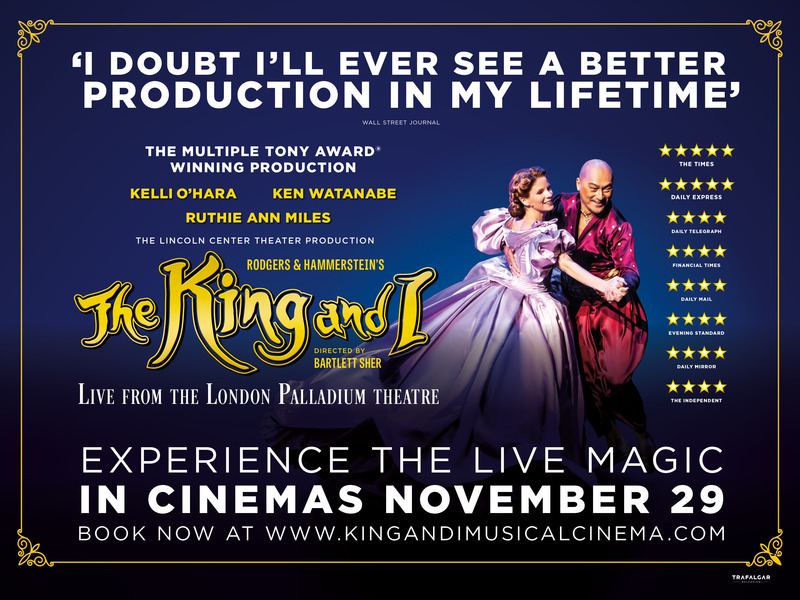 More than 135,000 movie goers packed into cinemas across the globe to watch THE KING AND I: FROM THE LONDON PALLADIUM– filmed on stage at the iconic London Palladium. Such has been the demand for tickets, Trafalgar Releasing has scheduled encore screenings both in the UK and globally throughout December. This majestic production, directed by Tony Award-winner Bartlett Sher, first opened on Broadway in 2015 for a critically acclaimed 16 month run at The Lincoln Center Theater, this was followed by an unprecedented record-breaking sold out USA tour. The show then transferred to the London Palladium in June this year, with the three original Broadway lead actors reprising their starring roles – Tony Award-winner (Best Performance by an Actress in a Leading Role in a Musical for The King and I) Kelli O’Hara, Tony and Oscar nominee Ken Watanabe and Tony Award-winner (Best Performance by an Actress in a Featured Role in a Musical for The King and I) Ruthie Ann Miles. The London production drew huge critical acclaim, played to packed houses, received nightly standing ovations and smashed box office records – including the biggest grossing week in the London Palladium’s history, taking £1,058,317.50 for an eight performance week. Set in 1860s Bangkok, the musical tells the story of the unconventional and tempestuous relationship that develops between the King of Siam and Anna, a British schoolteacher whom the modernist King, in an imperialistic world, brings to Siam to teach his many wives and children. With one of the finest scores ever written including; Whistle a Happy Tune, Getting to Know You and Shall We Dance,and featuring a company of over 50 world-class performers, THE KING AND I: FROM THE PALLADIUM is a testament to the lavish heritage of gloriously romantic musical theatre – it is the greatest musical from the golden age of musicals. Tags: event cinema, Trafalgar Releasing, Musical Theatre, "The King and I"